Do you crave one-on-one assistance to begin or complete a creative writing project? Are you better served with personal guidance rather than a group setting? Lauren can work directly with you to shape an idea that you just haven’t been able to move along. Email her for more info. Poetry is so good at distilling image and sound to bring compassionate awareness to subjects that scare or confuse us. But what is poetry, really? Can you understand it? Can you learn to write it? For these three sessions, we’ll talk about and practice several different approaches to writing a poem. There’s both play and work in finding those wild word rhythms, building images and perspective, and learning to economize what you write to its most potent. All of this will give you a better understanding of some of the tools a poet uses. Class full! • Contact Lauren to get on the waiting list. 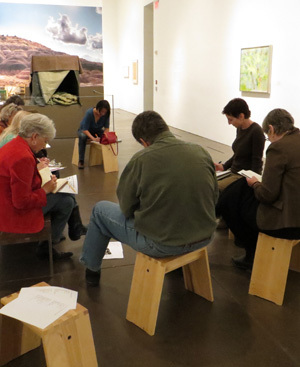 This workshop offers inspiration in all genres — fiction, memoir, poetry. We’ll read, discuss and write, using unconventional prompts and exercises. We’ll build listening skills, word banks and approaches, always searching to understand and capture emotion, and finding alternatives to traditional ways of phrasing. In this workshop, we’ll begin to make your poem, story or essay exactly right for the ear and eye, working line by line and word by word. We’ll also discuss how to clarify images, tone and direction. With so many things to worry over, we need to keep finding joy and celebrating gratitude. This feel–good workshop will help you write in praise of small beauties, large events or anything in between. Learn how to move beyond the obvious like and love into the deeper and more magnificent why. We will map at least one wonderfully ordinary element of our lives, lifting the subject up and enriching it with the finest elements of craft and wild attention. The ancient pantoum is the ideal form for writing about the past. With a little direction, even uncertain writers are eased into shaping their crystalline memories, and more experienced writers will have the chance to delve into subjects that might not have opened up for them before. Excitement builds quickly as students follow the form through to its ending.